The owner of Perak Roadways Bhd is a Perak man who had dreamed to have his own transportation company when he was 12 years old. Now, he has proved his ability to make his own dream come true. Perak Roadways Bhd was established in 1954. Within 63 years from 1954, the company has constantly challenged the norms and has expanded into uncharted territories by new ventures and investments. In September 2016, the company fleet size expanded to 146 buses, 119 buses to serve the local communities and short haul trips while the rest used for express bus services. Today, company has become one of the biggest transportation companies in Perak. Perak Roadways Bhd is based in Ipoh, Perak. They are providing routine bus services for the route from Ipoh to Lumut, Gerik, Lenggong and Pengkalan Hulu. 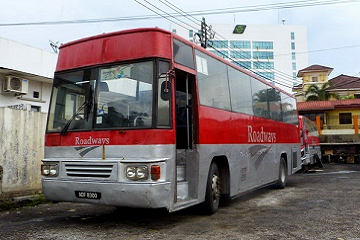 The buses offered by Perak Roadways Bhd connect the communities and small towns by offering daily bus routes from town to town. These daily bus routes from Ipoh Amanjaya to Gerik, Lenggong and Kompleks Imigrasen Bukit Berapit (Pengkalan Hulu) and it offers return routes too. Besides, they also offer bus services departing from Ipoh (Perak Roadways Bus Station) to Gerik, Lenggong and Kompleks Imigrasen Bukit Berapit (Pengkalan Hulu) and its return routes. The buses possessed by Perak Roadways Bhd are mainly single deck with 40 seats. Book Perak Roadways Bhd bus ticket now at Easybook.com.